The Cleveland Browns have a history of missing out on talent in the NFL Draft, and fans are fearing that it will happen again in 2017. The Cleveland Browns have a habit of completely whiffing on draft picks, contributing to a perpetual cycle of losing and frustration. It would be hard to imagine the Browns missing out on talent when holding the No. 1 and No. 12 overall picks in the 2017 NFL Draft, but its the Browns so no one is optimistic just yet. The latest news is that the Browns are looking to trade one of the first-round picks for Jimmy Garoppolo, which has some fans panicking. 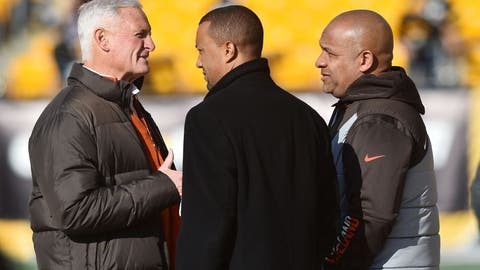 The thought of disregarding the deficiencies all over the field to invest heavily in the quarterback position is not what the Browns need to do right now, so hopefully these are nothing more than rumors. Now it is unfair to say Garoppolo could not succeed as an NFL starting quarterback, but the likelihood of that happening in Cleveland is low if the rest of the roster is not drastically improved. And the way to do that, which the front office allegedly plans on doing, is to build through the NFL Draft. Trading picks for a project at quarterback will only lead to fans looking at the 2017 draft board and picking out all the stars the Browns missed out on. It has happened with players like Julio Jones, Odell Beckham, Derek Carr, and countless other NFL stars. The Browns always seem to overthink the draft process, instead of just taking the most talented player. The Garoppolo rumors seem to point toward the Browns trading the No. 12 overall pick, but that still allows for the possibility of the team taking a quarterback No. 1 overall as well. Could you imagine? The Browns acquiring two quarterbacks in the first round, while not improving the defense, would be an absolute disaster. Fans would cringe whenever Myles Garrett or Jonathan Allen made a great play, the same way it is hard to watch Khalil Mack dominate for Oakland, knowing he could be a Brown. At least Justin Gilbert was a good alternative, right? This time of year always involves rumors that some fans love and others hate, but the idea of trading yet another first-round pick is something that should have no one excited. The Browns need to take the most talented player at each available draft slot, or accept the fact that talent will be missed out on once again.